8 But as soon as Jeremiah finished telling all the people everything the Lord had commanded him to say, the priests, the prophets and all the people seized him and said, “You must die! 9 Why do you prophesy in the Lord’s name that this house will be like Shiloh and this city will be desolate and deserted?” And all the people crowded around Jeremiah in the house of the Lord. You’re just sitting around the table at Bible on Tap in the front yard of Intrinsic Smokehouse in downtown Garland and can’t believe your eyes! The guy ran out of the bank and flipped the pillowcase of money over his shoulder and took off running down the street. His black clothes let him blend into the shadows as he made his way East toward the warehouses and auto businesses along 1st Street. Once in between the buildings the young man quickly wove his way to his carefully chosen getaway spot—an old abandon basement or den under a shed. There he could lay low for a while. Once inside the basement he pulled out a small light and was startled to see that he wasn’t alone! There was another person in the den! “Oh no!” he thought, “I’m going to be discovered!” But, then he did a double take looking at the other person in the basement and turns out he was a robber, too, with black clothes, his own sake of money and looking just as surprised as he was. And since the two of them were both robbers trying to hide, the two introduced themselves, got to know each other and became friends. And you know what I’ve just described to you…. A den of thieves!! Jeremiah was not there of his own volition, but he was there representing God. He merely told them what God’s Word said. Those in the den acted as if they could get rid of their problem by getting rid of Jeremiah. But it wasn’t true. Their problem was not with Jeremiah, but with God. 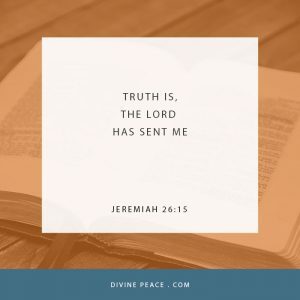 Jeremiah knew that he was resting in the strong hands of God and either the people would repent and there would be peace, or they would kill him, and he would be perfect….. in heaven. Why? Because they were lost chicks. And. Jesus is the true Hen! (There’s a name for God we don’t often use!). Jesus looked at a City that he knew was about to turn on him to the point of nailing him to the cross. However, he was not to be intimidated because he was prepared to walk into that den of sinners with the mission of saving them from the punishment of all their sins. Jesus is the true Hen with Wings of true forgiveness, love, safety and peace for a den of sinners. The robbers in our illustration were surprised upon seeing each other in their den. Can you wrap your heads around the love Jesus had to walk into the den of the world full of sinners—of us! To take upon himself our punishment, our suffering, our eternal death in hell by having his “wings” no, his arms and hands nailed to the cross! Jesus has prepared us to live eternally in the den’s, no the mansions, of our Father in heaven with his precious word—forgiven! Let us never forget this as we think about the “dens” of our life! Let us never forget how important it is for us to be here in this den of God’s people to hear his Word and receive his holy Sacrament. Let us make our homes a den of God’s people where God gives us strength to share life’s hardships, struggles, temptations, and forgive and deal with the consequences with God’s Word and forgiveness. This is the strength in Jesus God have given to you so we can deal with our dens of life. Be aware that Satan doesn’t want peace your dens of life! Just like in Jeremiah’s day, the people we see and meet will often reject God’s Word. Their motto for life was not to listen and believe God’s Word, but sadly to listen to and believe their own words. Two robbers sitting in a basement might shake hands, support each other, and have a moment of friendship, but it doesn’t mean they’re not in trouble. A den of robbers is certainly in trouble and they’ll find out how much trouble they’re in when someone finds them. God used Jeremiah to find his lost people in their den. They were greatly blessed to have the Lord God and Jeremiah love them enough to seek and to save them. Death brought no worry or fear to Jeremiah. He was safe as he rested in God’s strong hands. The people of Jerusalem were the ones in danger of murdering an innocent prophet. We know there has been a long line of prophets that entered the den of sinners and never made it out alive. Today there are Christians being persecuted, yes, even put to death for proclaiming the love of Jesus. Our Strength is in the hands of our gracious God. And that makes us all drawn to other people and their eternal well-being. God’s Word strengthens us for sentencing and prepare us to deal with the dens around us. Amen.